Everyone wants to know what Riley Nash is going to do next but they're going to have to wait a little while longer because... he doesn't know yet. Look back at your life for a minute and when you do, try to reflect on the biggest decision you ever had to make? Regardless of the outcome - right or wrong, or good or bad... just what was the biggest, toughest, life altering choice you had to make? How old were you? Your career choice? Your spouse? Your kids? Riley Nash has come to the crossroads in his life and is facing the biggest decision he's had to make so far and perhaps ever will. At least that's the way he described it to me when I chatted with him on Monday afternoon. As all Oiler fans know, Nash was drafted by the Edmonton Oilers back in 2007 with a 1st round pick they traded up to get. The organization gave up a lot to get that opportunity, the 30th and 36th overall picks went to Phoenix, and they've waited patiently for him to turn pro. Now, it's my impression, that patience is wearing thin. 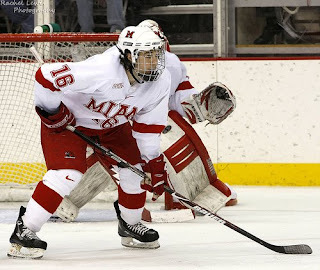 They're not exactly head over heels in regards to his development so far at Cornell; he was listed as 6'1 and 173 lbs at the 2007 NHL Draft and now two years later he checks in as just 6 pounds heavier. Cornell's late schedule meant that by the time Canada's World Junior camp took place in December, Nash had played just 12 games including a pair of pre-season exhibitions. By comparison, fellow Oiler prospects Jordan Eberle played 8 times in the two weeks leading up to the same camp and had 30 or so games already under his belt. One of them was cut and one of them made the final Canadian roster and sources tell TPS that coach Pat Quinn said it wasn't even close in regards to the game readiness of the NCAA players compared to their CHL counterparts. 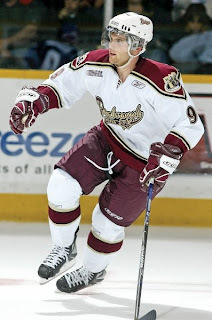 Is 20-year-old Riley Nash the same player he would have been had he decided to play in the CHL? Without getting into the CHL/NCAA debate let's frame the question a different way. 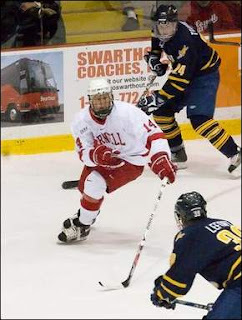 Would 20-year-old Riley Nash be a better player today had he gone to North Dakota or Denver instead of Cornell? The college route is supposed to provide so much more time for physical training yet the Oilers look at Nash and see a player who is physically older and more mature but only a handful of pounds bigger. Statistically speaking, Nash increased his scoring by a grand total of 3 points; 35 points up from 32 as a freshman. from Edmonton's perspective... what's the point of staying another season where he's (a) playing fewer games than they'd like (b) not developing as physically as they expected and (c) his statistical production appears to be stagnating? But that's a hockey team's view of their asset so you can understand why things like scholastic advancement and a college degree don't weigh as heavily. For Riley Nash though, he's trying to weigh several things all at once. He knows the Oilers really want him to leave school now just like he knows the business degree he's striving towards might not be as useful in a world where the economy is a growing concern. He knows people think he chose Cornell simply to play with his big brother, which he concedes was a factor but insists it's no longer the reason he might choose to stay another year (or more). No, for Nash, this is a decision that isn't as simple as waiting for a roster spot to open up with the Oilers. Education is important to him and there is a sense of obligation at work here too in that Nash feels he owes Cornell both on and off the ice for taking him in the first place. Oiler fans might say "dude... you're going to be a pro hockey player, who cares about the education when you'll be playing for millions of dollars??" That's a scenario that isn't lost on Nash but nothing is guaranteed in this life and he wants to make sure that the timing is right on all fronts and not just with the Oilers. He himself isn't sure that he's ready for the pro game and told me in as many words that he thinks there are still things he can learn playing at the college level. The problems is, the more he waits to turn pro the more his development could stall (if the NHL team's concerns are accurate). Nash has had discussions with his family advisor (agent for non-collegians) and is now trying to figure out what the best thing is for him to do. The Springfield Falcons only have 6 games left and they'll be done for the year after April 11th. Having spoken with Nash I don't get the sense that he's going to make a snap decision and while no one has given him any kind of deadline to make up his mind, the 11th of April is 12 days away, and what would be the point of signing only to play one or two games? If Nash hasn't turned pro by this weekend's 4-game stretch, what real motivation will there be for him to do so before next fall? 2 AHL games? The Oilers and their fans might think that's enough but I don't know if Nash agrees. And it's his life. The ten finalists for the Hobey Baker Award were announced back on March 19th but the field will be narrowed down to the "Hobey Hat Trick" this coming Thursday April 2nd. Here now are my own personal top 5, they'll be different choices from many people I'm sure and there's no guarantee that even one of my five will be in the Hat Trick let alone the eventual 2009 Hobey Baker winner. I'd be interested to hear from those of you who are able to follow NCAA hockey more than we can up here, you tell us who the favorites should be. He's one of the most talented players in college hockey and has the individual stats and awards to prove it. 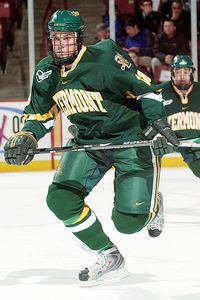 He was drafted 7th overall by Nashville at the 2008 NHL Draft and there was a lot of talk that he would skip the rest of his college career and jump straight to the NHL. He chose instead to return for his sophomore season and went on to lead the Terriers in scoring with 52 points in 41 games... so far. He's picked up a bunch of individual Hockey East accolades and scpred 3 points in a 5-2 Bean Pot Final victory. His charity work revolves around 'Autism Speaks' and his major is History. Wilson was a guest on The Pipeline Show in May of 2008. Downside: No mention of scholastic achievement. As far as I know, the Hobey Baker Award has never been one by a European player (wrong! see comments). Stalberg hails from Sweden and was drafted by the Toronto Maple Leafs in the 6th round back in 2006. He's wrapping up his junior season at Vermont and he was very productive this year scoring 24 goals and 45 points. Like Wilson, his season isn't quite done yet so he's got a chance to pad his stats and maybe capture a National Title in the process. Academically he's got a 3.6 GPA as a Business Administration major. I find it impressive that an import can succeed so well both at the rink and in the classroom. Downside: No mention of charity work. The only goalie to make my list is also the only Canadian. 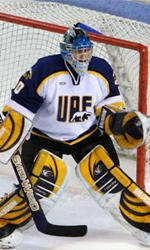 The former AJHL goalie was drafted by Pittsburgh in the 5th round of the 2006 draft and has now completed his NCAA career. Johnson recently signed with the Penguins. On the ice, Johnson's .939 save percentage was tops in the country and he had a 1.69 GAA and 6 shutouts to go along with it. The fact that his record is 14-14-5, coupled with those impressive stats, suggests a quality netminder on a team with little defence. Away from the rink Johnson volunteers with Habitat For Humanity. Downside: No mention of scholastic achievements. I'll admit I'm a sucker for an emotional story and Matt Gilroy's telling of why he wears #97 in honor of his deceased little brother... well it had me going. He's riding an ironman streak of +140 games and has the distinction of being the first player in Hockey East to be named a First Team player three times. Talk about character, this is a guy who paid his own way this year after the program gave his scholarship away because they were positive he was turning pro last summer! His charity work includes Autism Speaks and volunteer work at a Long Island summer basketball league. Gilroy was a guest on The Pipeline Show on March 24th. Like Gilroy, Lamoureux has a captivating back story as well. Long story short - he was deemed mentally unfit to join the military a few years ago as he fought inner demons that nearly led to his suicide. With help from family and his own inner will, Lamoureux has not only taken control of his personal life but he's giving back by visiting schools and speaking to kids about suicide and ways to survive life's problems. On the ice he's one of NCAA hockey's leading scorers with 53 points in 41 games - after missing a year because of a transfer from Northern Michigan! His family is drenched in hockey from his father, his twin sisters to his brothers including Jean-Philippe who was up for the Hobey last year as goalie for North Dakota. Lamoureux was a guest on The Pipeline Show this past November 18th. Downside: No mention of scholastic achievements aside from "completion of Combat Survival Training". The Miami RedHawks may have been a #4 seed but they punched their ticket to the Frozen Four by beating #1 Denver and #2 Minnesota-Duluth this weekend. Justin Mericer's two goals were enough to get the RedHawks to Washington D.C. as the Bulldogs could only put one passed Miami netminder Cody Reichard in the 2-1 loss. The senior had a down season compared to last year but when the Colorado prospect needed to come through, he did. Duluth goaltender Alex Stalock (SJ)only faced 19 shots but the pair of second period goals that beat him were enough. The Bulldogs struck for 26 shots of their own. Miami now waits to see who wins tomorrow's surprising Midwest Regional final as Cornell and Bemidji pulled off upsets earlier on Saturday. (For the Big Red story, see the blog post from earlier today). The Beavers' 5-1 demolition of heavily favored Notre Dame will go down in history as one of the biggest NCAA tournament upsets of all time. The now classic Holy Cross victory over Minnesota might be the exception. Tyler Scofield, of Prince George BC, led the Beavers with a pair of goals and an assist in the stunning romp over the Fighting Irish who, well, didn't put up much of a fight at all. Notre Dame goaltender Jordan Pearce allowed 5 goals on 19 shots while his Bemidji counterpart, Matt Dalton, was only beaten once while facing 35 rubber bullets. On the other half of the tournament bracket another Frozen Four spot was claimed, this time by the Catamounts of Vermont. Listen, The Pipeline Show doesn't think Vermont should have been one of the 16 teams in the tournament because they didn't show up in the Hockey East playoffs, and their presence in the Frozen Four just further cements our opinion that the system is flawed. Vermont's double overtime win over Air Force came when sophomore Dan Lawson netted his second marker of the game, midway through the 5th period. 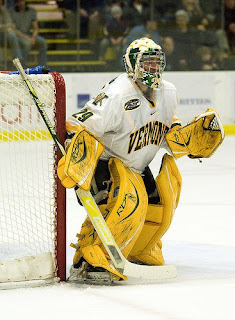 The story of the game was the awesome goaltending dual put on by Vermont's Rob Madore and Andrew Volkening between the pipes for the Falcons. Madore made 46 saves while Volkening stopped 32 shots. The Catamounts thought they had scored the winner at the end of the first overtime period but a last second goal line save pushed the game to another period. 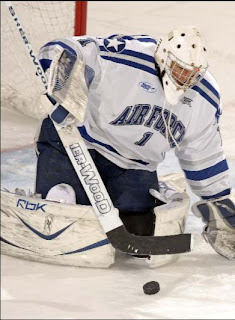 The loss ended Air Force's quest to be the first AHA team to reach the Frozen Four. 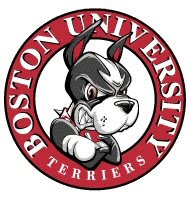 Sunday's games will complete the Frozen Four picture as heavily favored Boston University takes on Hockey East rival New Hampshire to go along with the clash between Cornell and Bemidji State. The Terriers did what the top seeds are supposed to do early on - they hammered the #4 seeded Ohio State Buckeyes to the tune of 8-3. The bottom line: Only one #1 seed remains (Boston University) while all four #2 seeds have already been eliminated. I guess maybe it paid to get swept early in the Conference tournaments - Vermont, New Hampshire and Miami are still alive after horrible loses two weeks ago. Day 2 of the NCAA tournament started much like Day 1 with the upsets continuing, this time ending the year for #2 seeds North Dakota and Northeastern. Cornell's last minute goal with 17 seconds remaining gave them the 3-2 win over the Northeastern Huskies, a team that has been ranked in the top 5 pretty much all season long. The Big Red trailed 2-0 at one point in the game but scored three unanswered goals to advance to tomorrow's Midwest Regional against the winner of tonight's game between #1 Notre Dame and #4 Bemidji State. 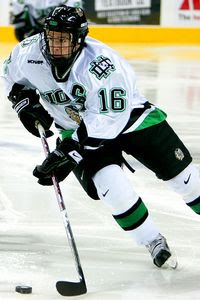 In the early game the North Dakota Fighting Sioux blew a mid third period 5-3 lead to drop a 6-5 overtime loss to New Hampshire. Chris Vande Velde (EDM) scored at the 9:08 mark of the final frame putting UND up by a commanding 5-3 margin but UNH got within one just two minutes later. Then with just one tick left on the clock, the Wildcats equalled the score and sent it in to extra time. O.T. only last 45 seconds before Peter LeBlanc beat Brad Eidsness for the game winner. New Hampshire now watches tonight's game between #1 seeded Boston Univeristy and #4 Ohio State with great interest. They will play the winner of that game tomorrow for a chance to go to the Frozen Four in Washington D.C. There are two first round games left to play and you know the underdog Beavers and Buckeyes are hoping the trend of stunning upsets continues. Two #1 seeds (Michigan and Denver) are already toast while only a single #2 seed (Minn.-Duluth) remains alive. Also on tap tonight are the games between #4 Air Force and #3 Vermont as well as #4 Miami and #2 Duluth. 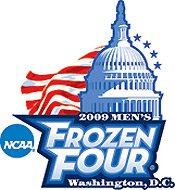 The winners of those two games will advance to the Frozen Four... it is at the very least, conceivable that a pair of #4 seeds could be amongst the last four clubs vying for the National title. 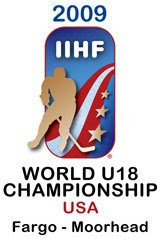 We were recently asked if we had any thoughts on a potential Canadian roster for the World U18s about that are about to start in Fargo on April 9th. Hockey Canada has named their coach but not the roster as they await for the first round playoff series to wrap up across all three CHL leagues before they do. Obviously they have a list of players they're looking at though and I have heard a few of the names that have been bandied about. What the final roster will look like is a great question but here are a bunch of guys I would imagine are in the discussion. I would have to think that Scott Stajcer of the Owen Sound Attack would be a leading candidate. He's ranked #2 by Central Scouting and #6 by ISS, but he's the highest ranked goalie available (Olivier Roy and Eduard Pasquale are still playing). There are a couple of WHL goalies worth consideration in Red Deer's Darcy Kuemper and Steven Stanford of the Prince Albert Raiders. Kuemper is #6 in North America for Central Scouting although ISS does not rank him inside their top 15. Kuemper was strong for a weak Rebels team and at 6'4 and 193 lbs is already pro sized. 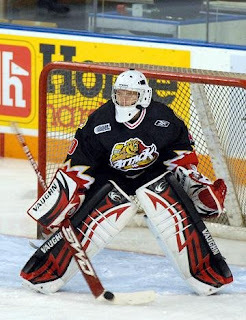 A fourth candidate is Brandon Foote of the Guelph Storm who is ranked 7th overall (goalies) by ISS. Central Scouting doesn't like him nearly as much though, they have Foote pegged at 30th just in North America. There is no doubt that Simon Despres is on the team (unless there is an injury I've not heard about). As soon as the Sea Dogs were eliminated I'm sure Hockey Canada wrote his name down in marker. Despres is a concensus 1st round pick for 2009 and quite likely a top 15 guy. 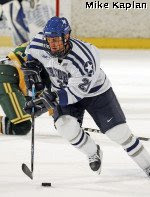 Another Q-League rearguard who should get a look is Eric Gelinas of the Lewiston Maineiacs. Gelinas had 39 points with Lewiston and at 6'2 and 190 lbs is a player that both Central Scouting and ISS have rated well. Central has him pegged at 31st NA and ISS slots him 72nd overall. Kingston Frontenacs defenceman Taylor Doherty could be in the mix as well. He's a monster at 6'6 and 215 lbs... and he just turned 18 on March 2nd! 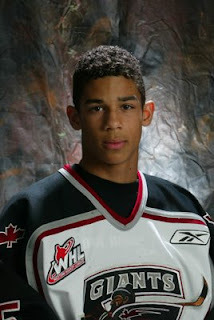 Speaking of giants on the blueline, how about Portland Winterhawks defender Brett Ponich? The Beamount product stands 6'7 and dents the scale to the tune of 205 lbs. You know that Calvin De Haan is going to be there. The Oshawa Generals defender is a 2nd rounder by both Central and ISS and with 63 points in 68 regular season games, De Haan looks like he could be Canada's go-to guy on the back end in terms of offence. The WHL will provide options as well including P.A. Raider Ryan Button. The Edmonton native had 37 points this year and plays a strong 2-way game. He's ranked 64th overall by ISS and 36th in NA by Central Scouting. Kootenay Ice defenceman Brayden McNabb is bound to be on the team after a strong season. He's 44th on the ISS list and everyone I've spoken with seem to agree that he's a second rounder for 2009. 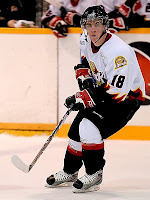 He had 36 points and 140 PIMs this year in Kootenay. 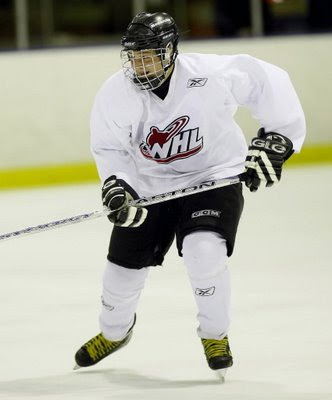 Brenden Dillon of the Seatlle Thunderbirds is the 41st player in NA according to Central Scouting. He only had 10 points this year but good teams need those defensive speacialists to win too. The BC native is 6'2 and just a hair under 200 lbs. New Coming Down the Pipe! guest blogger Dylan Olsen appears to have his name on the short list as well. The Camrose Kodiak had a good season on an average team, his last AJHL campaign before heading off to the NCAA next year. Olsen has some history with Hockey Canada after playing in the 2008 WJAC in Camrose back in November of this past season. A couple of Q options are Guillaume Goulet and Gabriel Bourque from the Baie-Comeau Drakkar. Both netted more than a point per game this year including a 45-goal season for Goulet. Both come listed at 5'9 though so maybe there is only room for one of them? The Saint John Sea Dogs could contribute more than just Despres on the back end. Both Steven Anthony and Michael Kirkpatrick should get consideration after the duo were in the top 3 of team scoring. Anthony gets more love from ISS and Central as both have him ranked around the 100 mark. 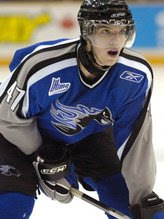 18-year-old Benjamin Casavant led the PEI Rocket in scoring with 80 points in 68 games. The big winger had 39 goals. He's way back on the rankings though. The OHL will offer up some very talented forwards including Ethan Werek of the Kingston Frontenacs (and Coming Down the Pipe!). Werek ended the year with 64 points in 66 games including 32 goals. The big winger is considered a mid-late 1st rounder by both ISS and Central. Peterborough's Zack Kassian will be there. He's got a history with Hockey Canada too and they'll need some big brusing forwards to help the smaller skilled guys survive. Kassian had 24 goals of his own this year so can definitely contribute too. The Erie Otters lost to London in round 1 thus freeing up Ryan O'Reilly in time for Fargo. The 2-way power forward was almost a point per game player this year but is better known for his tenacious style of play. Hockey Canada could be taken by Storm as a number of Guelph forward should be in the conversation beginning with Peter Holland. Another point-per-game guy this year, Holland is ranked as a top-15 pick by both ISS and Central Scouting. Also available from Guelph are Michael Latta and Taylor Beck. Latta ranks 57th by ISS while Beck outscored him by 22 points and comes in at 53rd on the list. Out west the Red Deer Rebels could provide a complete line if all 3 players are healthy enough to go. Landon Ferraro leads the pack after a 37-goal campaign but he's followed closely by Cass Mappin (missed the last 3-4 weeks with injury) and Willie Coetzee. Mappin is 27th for Central Scouting and Coetzee comes in 77th. 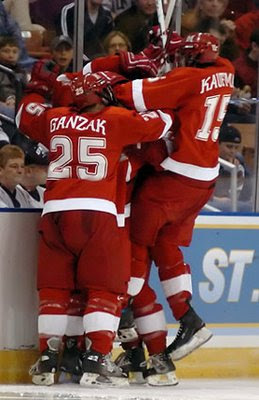 The trio finished 1-2-3 in scoring for the Rebels in 2008-09. Chilliwack Bruins forward Ryan Howse should be in the mix after a 31-goal season on a really poor team. The former 3rd overall pick could be much better once he's surrounded by quality teammates. Hockey Canada will be watching the Lethbridge/Saskatoon series intently. Hurricanes forward Carter Ashton (pictured) would be an obvious addition should Lethbrdige lose while the Blades could supply Burke Gallimore up front and Stefan Elliot on the blueline. With the Kamloops Blazers done for the year, Jimmy Bubnick is free to head to Fargo if Hockey Canada calls. He's big at 6'2 and 195 lbs and can play a checking role if need be. He comes in ranked 79th by ISS and 54th NA for Central. I'm not sure about the status of these two Jr.A players, they may still be playing in their league playoffs, but David Pacan and Brandon Pirri were both part of the 2008 WJAC with Team Canada East so have that history with Hockey Canada. Both are listed as mid-round picks. - Brett Connolly (Prince George): led his team in scoring this year and is up for Rookie of the Year award. Already ranked as a top-10 pick in 2010. 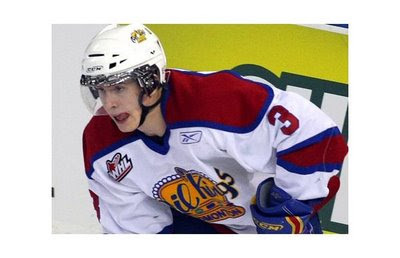 - Jordan Weal (Regina Pats): The other name on the ballot for WHL Rookie of the Year. Weal finished with 4 points less than Jordan Eberle and led the Pats with 54 assists. 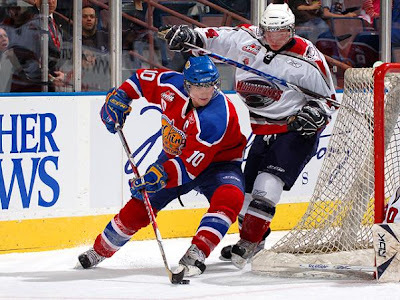 - Mark Pysyk (Edmonton Oil Kings): A solid 2-way defenceman that logs a ton of ice time in Edmonton and plays with the maturity of a seasoned junior vet. - Joey Hishon (Owen Sound Attack): Had a whopping 81 points and led his OHL team in scoring with a 25 point gap from second place. - Jeff Skinner (Kitchener Rangers): Had 51 points, third on his team in scoring, but led the Rangers with 27 goals. Those are just a few names to think about, I'm sure there are several worthy candidates that I have overlooked so feel free to list those guys in the comment section below. Hockey Canada is expected to announce the team shortly with their first official gathering sometime around April 2nd. The Springfield Falcons have signed Edmonton Oil Kings co-captain Jeff Lee to an amateur try out contract the team announced today. Lee, who joined the Oil Kings midway though the 2007-08 season after leaving the NCAA's Alaska-Fairbanks Nanooks, had a career year posting 22 goals and 62 points. The Calgary product is considered a hot commodity for CIS schools looking to bolster their line ups for next year and Lee told me yesterday that unless he had AHL options, CIS would be his route next year. With a good showing in Springfield, his AHL chances could become a reality. Lee is a 6'2, 209 lb power forward. Also headed to the AHL for the rest of the year is forward Brent Raedeke who will join the Grand Rapids Griffins. Raedeke was signed by the Detroit Red Wings last fall after attending their summer camp and main camp in September as a free agent invite. The watch is on for goaltender Torrie Jung who will wait to hear from Tampa Bay as to whether they'll send him to Norfolk (AHL) or more importantly, offer a contract. If not, Jung returns to the draft where he most certainly will get re-drafted. Just watching the Springfield Falcons take on the Worcester Sharks right now on the NHL network. There aren't a ton of reasons to want to watch the struggling Falcons right now, but Jordan Eberle is one. So far so good for the 2008 first rounder of the Oilers as he helped set up Ryan Potulny in the first period. It was Potulny's 31st goal and Eberle's first pro point. Currently it's 1-1 after 1. Eberle took a pass from Ryan Stone in the slot, put it towards the net where Potulny finished at the side of the cage. 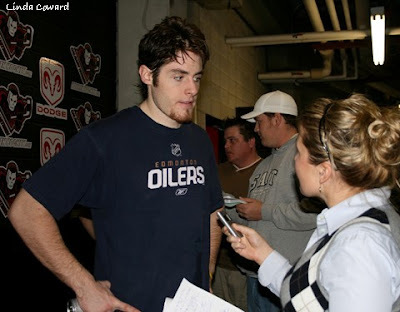 Guy and I were down at Rexall place today as the Oil Kings met with the media one final time. I was working for Global Guy was there for TPS and the TEAM 1260. Here are some of my thoughts and here is the link to hear all the one-on-ones from the morning. I'm really looking forward to seeing Mark Pysyk in 2 years and even next season. The guy played more than 20 minutes a game as a 16 year old, steadied the blue line and ran the power play. Very similar to Dion Phaneuf at that age with Red Deer. Contrary to popular belief, the Kings did win a playoff game. They beat PA to get into the post season. That, combined with their 4 game lesson from the Hitmen should make the club better prepared for next season. Remember Brenden Dowd, Jeff Lee and Brandon Lockerby next year if the Kings have a good playoff run. They are this year's 3 - 20 year olds that ended their WHL careers Wednesday night, but helped build a winning tradition in Edmonton this year. Speaking of 20 year olds, the Kings are hoping they have one in net next season. Torrie Jung told me he expects any contract talks with Tampa to begin after the NHL season. The best case scenario for Edmonton is that Jung signs with the bolts and they return him for his overage season with Edmonton. If the Lightning don't sign him, why not the Oilers. They can keep a watch on him and after next year, Jeff Deslauriers and Devan Dubnyk should be ready to mind the twine with the big club and Jung could slide into the AHL spot. A number of guys took advantage of increased playing time because of the many injuries suffered by the Kings this year. Kieren Friesen, Tyler Hlookoff, Michael Burns, Henrik Tervonen and even midget call up Travis Ewanyk from St. Albert gained valuable experience. Rocky Thompson's contract is up after this year, and Steve Pleau is in the option year of his, expect them both to be back behind the bench when the season starts next year. What to expect next year? Michael St. Croix will be looked to for offence, even though he'll only be 16. His midget team won the Manitoba AAA League playoffs this year, with St. Croix putting up 20 points in 8 games. Watch for him at the Telus Cup this year. Fellow Oil Kings draft pick Devin Ballness had 34 penalty minutes in 10 games with the Eastman Selects during the same post season run. Watch for St. Croix at the Canadian Midget championship starting April 20th in Selkirk, Manitoba. TSN will air the final game on April 26th at 5 PM mountain time. Well it certainly didn't take long for the NCAA National Tournament to produce a big upset. 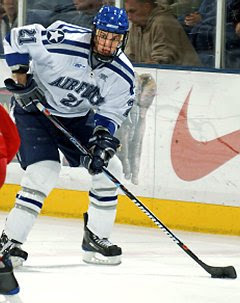 In the first game of the event the Michigan Wolverines were shutout and eliminated by Air Force as the Falcons scored a stunning 2-0 victory. Everything about this game suggests the Wolverines were absolutely dominant. The shots were 43-13 for Michigan and they also controlled the dot winning 41 of 63 faceoffs. So how did Air Force pull off the big upset? You've heard The Pipeline Show talk about him before and like he's done before, Volkening was a one-man giant killer. This was Volkening's third consecutive shutout as he posted blankings in his final two AHA playoff games and now another against Red Berenson's mighty Wolverines squad. In fact, with shutouts against Michigan, Bentley and Mercyhurst behind him, Volkening hasn't allowed a goal since March 15th against Sacred Heart. One goal against in his last four games... that is quality goaltending. 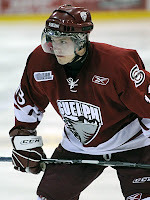 Jacques Lamoureux, another TPS favourite and past guest, scored the second goal for the Falcons helping show why he was named as one of the ten finalists for the Hobey Baker Award this year. The Falcons opened the scoring on a first period power play, one of only 3 shots they mustered in the opneing frame. They scored again in the second period despite having only fired 7 shots at Michigan starter Bryan Hogan to that point. Next up for Air Force, the winner between #3 Vermont and #2 Yale and quite frankly, I like the Falcons against either one of them. Remember that at one point earlier this year Air Force was a perfect 13-0 before losing a close game against Denver. After that they went into a bit of a funk but the Falcons ended the year very strong and cruised through their Conference playoffs in impressive fashion. Don't look now but... Air Force in the Frozen Four? It's one big step closer to reality after today's upset. The Pipeline Show is pleased to welcome yet another guest blogger as we ramp up our draft countdown and coverage. 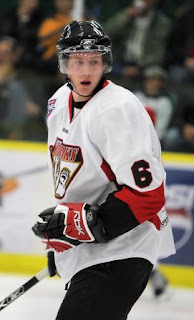 Penning his thoughts will be Camrose Kodiak Defenceman Dylan Olsen who is ranked 34th by ISS for the upcoming draft. Look for his first entry in the next week. The Calgary kid put up 10 goals and 29 points in 53 games this year for Camrose, his second season with the Kodiaks. 5 of his goals came on the power play and the 6.02, 205 pound rearguard picked up more than 120 penalty minutes. He also notched 7 points in 10 playoff games before Camrose was eliminated. Olsen has committed to the University of Minnesota-Duluth. Olsen represented Team Canada West at the World Junior A Challenge in November, a tournament held in Camrose, and TPS has learned, Olsen will be picked to wear the Maple Leaf once again this Spring at the Under 18's in Fargo. Team Canada is meeting April 2nd in Minnesota to get ready for the tournament that starts April 9th. Canada is the defending champions after blowing out Russia 8-0 in last year's final. I'm not sure when Canada's roster will be officially released, but I'm wondering if Oil Kings blueliner Mark Pysyk will be on it. Sure he's only 16 but he was terrific this year for the Kings playing more than 20 minutes a night, steadying the back end and running the power play. He might not have the points of a Jordan Weal in Regina, but he was just as effective when it comes to first year players. The National Tournament for NCAA hockey begins today and 3 Canadians think they know what's going to happen and proudly present... our brackets! Show hosts Dean Millard and Guy Flaming as well as button pushing ninja Taylor "The Sports Doctor" Medach make up The Pipeline Show NCAA panel. 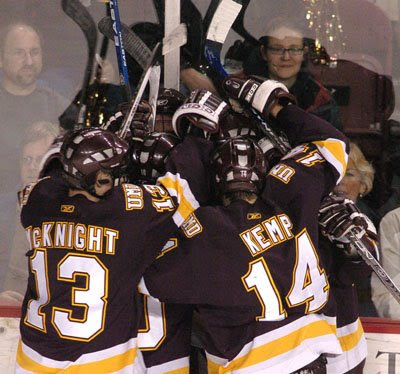 Recently Dean was asked why we seem to dedicate so much of our live show to talking about NCAA hockey. Afterall, we're based in Edmonton Canada... about a million miles away from the nearest NCAA hockey school, so who really cares? We're located in what is now a WHL city and our radio home is the TEAM 1260, the rights holder station for the Edmonton Oil Kings. 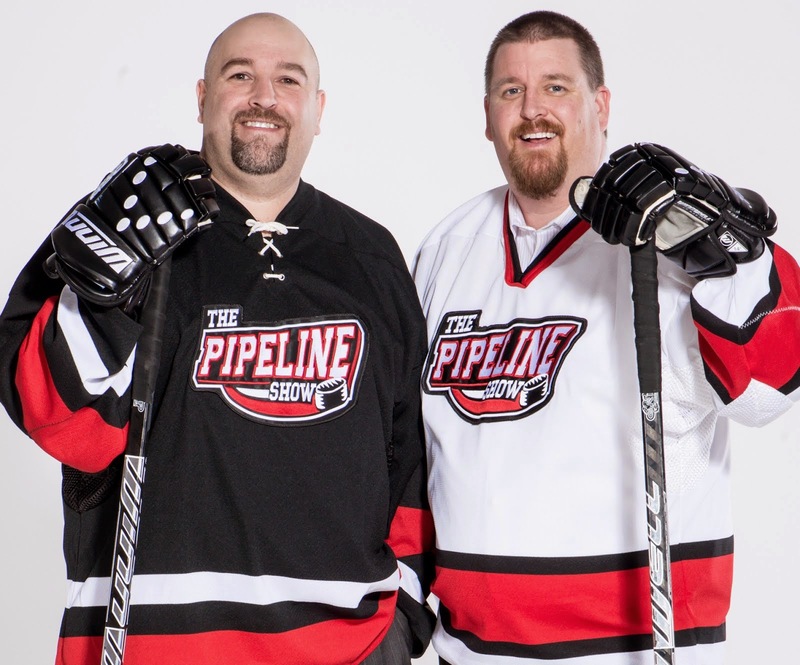 I've been asked before if it's a conflict of interest for The Pipeline Show to be talking about NCAA or the USHL or even the AJHL in light of the fact that all of those leagues could be seen as competitors to the CHL and the WHL in particular. The answer is No. It is definitely not a conflict of interest and I can assure everyone of our listeners that The Pipeline Show will not cease our coverage of those other leagues. We strongly believe that covering the NCAA, USHL and Canadian Jr.A is what makes us different and that's one of the reasons why it's a priority for us. The fact that we dedicate a segment each and every week to the NCAA has brought in a lot of dedicated listeners from well outside of the TEAM 1260's broadcast range. We get a ton of traffic to the blog and the main site from listeners south of the border, many of whom tell us that it's great to hear coverage from outside the immediate NCAA media. Going by that, one could argue that 24.7% of our show should consit of NCAA content... right? That said, Dean and I both feel that not covering NCAA, USHL and Jr.A would be neglecting a huge chunk of our demographic including those geographically nearest to us in Western Canada. Confused? I don't think the general fan is actually aware of just how many Canadians that there are on NCAA rosters. To that end, I undertook the painstaking task of going through every individual NCAA team's roster (according to USCHO.com) and doing the calculator work to find out. Only 3 teams in the entire NCAA have zero Canadian content, those being the military programs of Air Force and Army (for obvious reasons) and the Minnesota Golden Gophers. That 34.1% number of Canadians is obviously a mixture of budding superstars and players there more for the scholarship than a future in the game - just like the Americans who are in the league. Some will suggest that the top NCAA teams will have less Canadian content because they can draw the top American players and don't have to resort to filling out their roster from the bottomless pool of available Canadians. 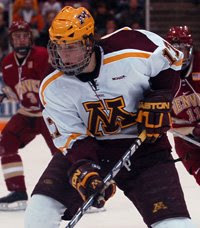 There is some truth to that - the Gophers don't even have to go outside of their own state to find players, many Minnesotans dream of wearing that big M.
New Hampshire and Boston College only have a pair of Canadians each while both Miami and Notre Dame have just a single Canuck on their team. 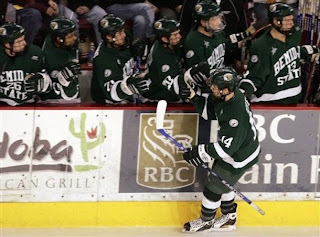 However, some of the traditional powerhouse programs augment their line ups with Canadians and typically these are WCHA clubs like North Dakota (52%) and Denver (33%). Often those players are not just there filling out rosters but are playing lead roles like in Duluth this year where most of the top scorers are former AJHL players. Joe Colborne & Jesse Martin (Denver), Kieran Millan (Boston University), Ryan Duncan (North Dakota), coach Red Berenson (Michigan), Riley Nash (Cornell), Lee Jubinville & coach Guy Gadowsky (Princeton), Zac Dalpe (Ohio State) and Mike Connolly (Minn.-Duluth). Aside from all being Canadians, another fact they all share... they've all been on The Pipeline Show. Considering how key NCAA hockey is to players who come from Canada, not to mention their family and friends who want to follow them once they leave, we feel it's more than just an obligation on our part - it's a corner stone of the show. Next Tuesday we'll be providing listeners with a 1-hour round table discussion previewing the Frozen Four with a couple of TPS regulars in D.J. Powers (Hockey's Future) and Paula Weston (USCHO). The following week is reserved for our annual Frozen Four Coach's Show where we plan on speaking with the bench bosses of all four programs in advance of the pivotal weekend of NCAA play. Too much NCAA coverage? To be hoenst, since a typical show consists of 4 guest segments and we dedicate one to college hockey (25%), you could make an argument that we're barely doing enough! Over the last four years The Pipeline Show has delivered pre-NHL interviews with current or future superstars including Kyle Turris (PHX), James vanRiemsdyk (PHI), Colin Wilson (NSH), Jonathan Toews (CHI), Andrew Cogliano (EDM), Ryan McDonagh (MTL), as well as current top free agents Tyler Bozak and Matt Gilroy. We like to think that that's a pretty good start... but we're far from done! Observations on the WHL Western Conference Playoffs so Far. Observations on the Western Conference Playoffs so far. 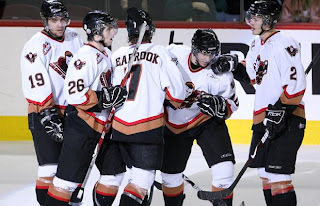 As expected the Prince George Cougars were easily dispatched by the Vancouver Giants in 4 straight. The Giants dominated the first two games in Vancouver winning 8-2 and 9-1. The Cougars looked much better at home which was not a huge surprise considering 18 of their 25 wins came in their own barn. The Cats did not have enough even at home as the Giants rounded out the series with a pair of 3-2 wins, the first one came in overtime. 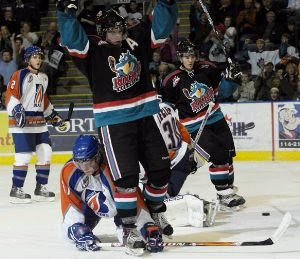 Surprisingly the Kamloops Blazers bowed out in 4 consecutive games against the Kelowna Rockets. The Blazers managed to score the first goal in 3 of the 4 games, and it looked like they had atleast one win as they were up 2-1 in the third game with 3 seconds to go. The Rockets tied it and then won it in overtime. In game 4 they would complete the sweep winning 5-3. The other two series are still going states side. Spokane is up 3 games to one on the Thunderbirds after taking both games in the Seattle. The Chiefs can wrap it up on Saturday at home. Tri-City has a 2 to 1 series advantage over Everett with game 4 set for Everett on Friday. Chet Pickard has played all 3 games so far after returning from a concussion late in the season. Right now it looks like the top 4 teams are on a collision course for the second round out west. Likely you won’t see any sweeps in the next round with each team a league contender. That’s the Down-Low with Bristowe. The Calgary Hitmen put an end to a successful second season for the Edmonton Oil Kings with a decisive 4-1 victory to win their opening WHL playoff series in 4 straight games. Make no mistake about it, the Hitmen are an exceptional hockey club. They were without 100-point forward Brett Sonne on Wednesday night and didn't miss a beat firing 43 shots at Edmonton netminder Torrie Jung. Kris Foucault scored twice while Brandon Kozun and Kyle Bortis added singles in the clinching game in front of a lively crowd of 6387 at Rexall Place. Edmonton's Brett Breitkreuz and Oil prospect Alex Plante had a spirited bout before the game was even two minutes old and that got the crowd into it early. Edmonton was outshot in the opening period to the tune of 14-6 but most people on the catwalk thought those numbers were off a bit as the home side had played pretty strong. The Oil Kings opened the scoring after Robin Soudek slid a pass across the slot to a wide open Brent Raedeke (DET) for a power play goal. For the next several minutes Edmonton had Calgary on their heels; Jeff Lee stepped up the physical play by throwing a trio of hits during one single shift including a pair which sent Hitmen flying. It was apparent early in the second though that Calgary wasn't going to be intimidated and they assumed control over the game in almost every facet. Goalie Martin Jones, the CHL stopper of the week, was sharp when needed and ended the series having allowed just 3 goals in 4 games. 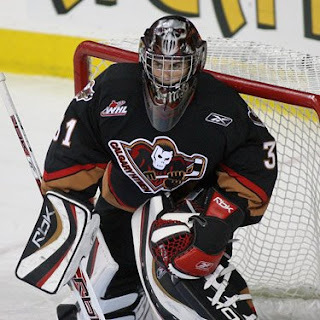 Joel Broda was the point leader for the Hitmen over the series totalling 7 points. Edmonton head coach Steve Pleau addressed the media after the game and spoke at length about what the short post season this year will mean to his team next season. He also paid tribute to the victorious Hitmen and made a variety of other comments that you can hear HERE. 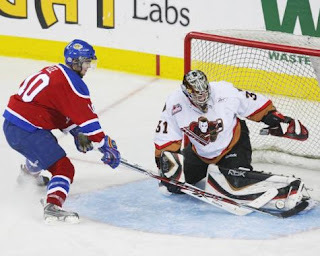 - This was the final WHL game in the careers of 20-year-old Oil Kings Brandon Lockerby, Brenden Dowd and Jeff Lee. I won't be shocked at all next year if Lockerby, a Manitoba native, is playing for the CIS Bisons and local product Jeff Lee is a member of the UofA Golden Bears. While I think Dowd could get a look from a pro team, he'd be a good fit for the Saskatchewan Huskies. - The Oil Kings are playing host to the annual WHL Bantam Draft at the end of April. The league awards banquet and draft will take place on Wednesday the 29th and Thursday the 30th respectively. Edmonton will be hosting the event for the next three consecutive years. - 19-year-old forward Shayne Neigum was a healthy scratch for game 4 after "violating a team rule". Neigum had been one of Edmonton's top performers through the first three games scoring one of their 3 goals but paid the price in the final game of the year. That's a really tough call for Steve Pleau who definitely could have used him but kudos to the coach for not deviating from the policy or making an exception based on the individual despite the team's need. Who says junior hockey teams only think about winning games? - Finally, the winner of The Pipeline Show's Oil Kings contest for correctly predicting that Edmonton would only score a total of three goals in the opening round is... "RED DEER REBEL". The Oil Kings are in possession of the jersey and once I get it returned to me with everyone's signatures, we'll arrange transfer of ownership over to you. Congratulations and thanks to everyone else who entered. We had entries from as far away as Saskatoon and even one from Sweden! This is one of my favorite pictures of Alex Plante. It was taken after a Calgary Hitmen game at the Saddledome and despite his surroundings he defiantly adorns the colours of the villainous NHL team up the road. Talk about being behind enemy lines! There is a lot of pressure that goes along with being a first round pick, even more so when you're taken by a Canadian team because you're under the microscope of the fanbase from draft day on. 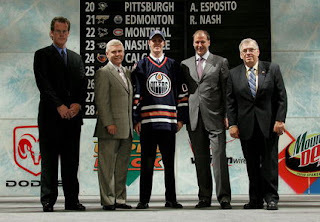 Plante was Edmonton's second choice at the 2007 NHL Entry Draft and its been a selection that Oiler fans have scrutinized ever since. 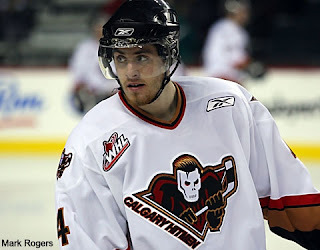 Many fans felt the Oilers were going off the board when they chose the Calgary Hitmen blueliner. Those draft day critics fed off Plante's injury riddled 2007-08 season and used his problems as evidence of their own personal justification for being against the Oiler draft decision. Many of those critics have been quieter this year as Plante has rebounded in fine fashion as a key part of the machine that the Hitmen have become. The #1 ranked team in the CHL is loaded with players having career years including Plante who has set personal highs in every category including points and penalty minutes. On Monday night Dean Millard was able to speak with Plante after the Hitmen captured game 3 of their opening round series against the Edmonton Oil Kings. In the TPS exclusive, Plante discusses everything from the team-bonding mohawks the Hitmen have adopted to the much-publicized training camp hold out, his own personal development this year and his possible future with the Edmonton Oilers as he awaits a contract offer. You can hear Millard's conversation with Oiler prospect Alex Plante... HERE. We began the program with a bang. 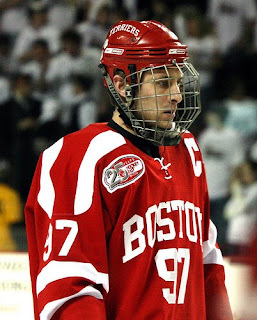 Matt Gilroy is a 24-year-old senior with the Boston University Terriers and is being followed by NHL scouts who want to get his under contract next month much the same way Fabian Brunnstrom was pursued this time last year. Gilroy's story is extremely interesting including chapters that could be called "Why I Turned Down the NHL", "No scholarship, no problem!" and "Tribute to Lost Brother". Last night Gilroy talked about it all but we still had time to talk about the NCAA national Tournament and winning the Hockey East title too. From there we couldn't connect with Dave Starman so Dean and I decided to go through our respective NCAA Hockey National Tournament brackets. We'll post them here before the tournament starts on Friday just so we have documented proof of our prognosticating prowess. It was then time for another monthly installment of the ISS Draft Countdown where head scout Mike Oke joins us to discuss the newest release from Internation Scouting Services. 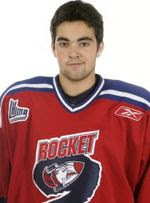 Last night we discussed teamless Kyle Palmieri, The World U18s, Cape Breton netminder Olivier Roy, Zach Kassian (pictured) of the Peterborough Petes and Brandon forward Scott Glennie. We also chatted with Edmonton Oil Kings GM Bob Green. We talked about the team's plight in their series against the mighty Calgary Hitmen, got updates on some key injuries and discussed the stellar play of netminder Torrie Jung and if there was optimism he may return as a 20-year-old. Green also gave us some insight into the WHL's Bantam draft which will be held in Edmonton for the next several years. Finally we ran some exclusive interviews with a handful of Hitmen including 50-goal scorer Joel Broda, defencemen Paul Postma and Alex Plante as well as 100-point man Brett Sonne. If you missed it live, you can click the archive... HERE!